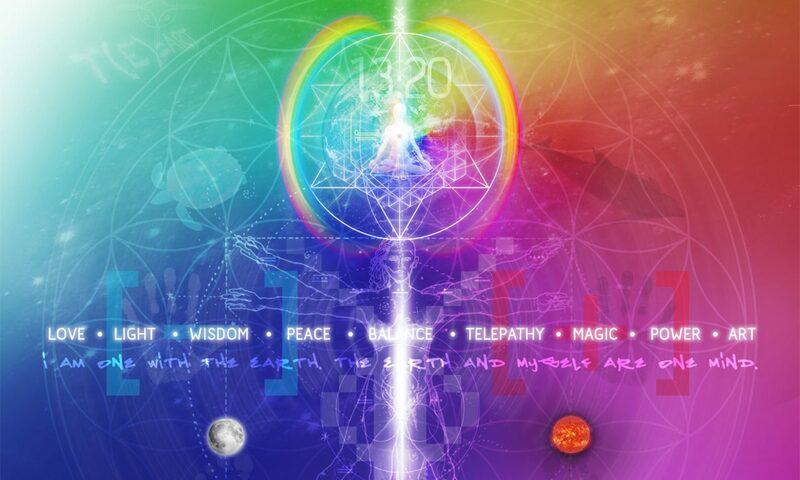 Tortuga 13:20 is an initiative dedicated to the visionary work of José and Lloydine Argüelles (Valum Votan & Bolon Ik, 1981-2002), the Messengers of the New Time who brought the synchronic codes by which many of us live our days today: the Dreamspell Journey, the 13:20 Harmonic Module (the 13:20 Tzolkin Matrix), the 13:28 Synchronometer and the Calendar of 13 Moons, the Telektonon Prophecy, the Law of Time is Art: T(E)=Art, the Seventh Power, the Rainbow Bridge Vision, amongst others. Tortuga 13:20 is reenacting the original form of this knowledge within the present context of the dimensional shift, in order to preserve its Universal Cultural Heritage for humankind, the evolution of Spiritual Consciousness and Planetary Peace. All under Fair Use for research and educational purposes only, and not for profit. The legacy of José and Lloydine Argüelles is a knowledge for all humankind. They shared this wisdom as a Gift for the evolution of human consciousness, and not to be sold in the marketplace or to be corrupted by business networks, neither to be abused in the personal quest to attain celebrity status. This is because the fundamental principle of their Discovery of the Law of Time is that 13:20 is the natural frequency of “Time is Art”, therefore it is the antipode of the 12:60 artificial frequency of “Time is Money”. The work of the Messengers of the New Time constitutes a universal heritage of humanity. For the same reason, their true story, statements and works shouldn’t be doctored, especially in regard to the truth and mystery about Lloydine Bolon Ik, the Archetypal Mother and Galactic Feminine co-creator of the New Time movement, the matriarch of the golden years (1981-2002). Her name shouldn’t be erased from the books, neither her memory should be removed from history. Tortuga 13:20 is also an International Node of the Planet Art Network (PAN), connecting planetary kin from different countries. We are also an independent PAN Media called Tortuga 13:20 Communications which is based in England, United Kingdom, featuring collaborators from around the world. A collective effort generating new information, ideas and actions. Our “Time is Art” Mission is to deliver Free, Accurate and Uncensored Galactic Maya information. Free of charge was the path of the founders. Together, they actually embodied “Time is Art” (13:20). They gifted their spiritual tools all over the world and never charged for their teachings. They always opposed to the sell out of spirituality (12:60 time is money). Accurate information means a dedicated research work based on their visionary synchronic codes and what they continuously unveil about the dimensional shift of 2012-2013. Uncensored information means that we don’t cut, remove or change their historical records or co-authored works. Our focus is the reconstruction of the Planet Art Legacy that was inscribed by José and Lloydine Argüelles during their perfect 21 years of prophetic ministry (1981-2002). In Loving Memory of our Great Teachers Valum Votan & Bolon Ik, Archetypal Mother and Father of the Planetary Kin, Ascended Masters of the New Time. Authors in Eternity of the Dreamspell Journey, the 13 Moon Calendar, the Telektonon Prophecy, The Discovery of the Law of Time is Art, the Galactic Culture Master Plan, the 28 Meditations on the Law of Time, amongst others. Co-Creators of the Planet Art Network (PAN), the Harmonic Convergence, The World Thirteen Moon Calendar Change Peace Movement, the Foundation for the Law of Time, the Rinri Project, the Day Out of Time, the Circumpolar Rainbow Bridge, and the Earth Wizards Seminaries, amongst others. The website of Tortuga1320.com is inspired in Tortuga.com (active between 1999-2003, online until 2013). This was the original website created by José and Lloydine to host the Planet Art Network, the Dreamspell community and the Thirteen Moon Calendar Movement. Tortuga is Spanish for “Turtle”. José and Lloydine spoke and taught in Spanish language as well. Turtle is a sacred animal totem which has 13 scales on its back, therefore it carries the wisdom and power of number 13. This number is particularly relevant within the 13:20 natural timing frequency of the Tzolkin (13 x 20 = 260) and the 13:28 code of the 13 Moon Calendar. “All Indigenous Peoples of the Earth know and respect the wisdom and power of the turtle. Within turtle’s shell is the knowledge of time and the wisdom of the thirteen moons. Turtle’s wisdom is the power of cosmic knowledge. 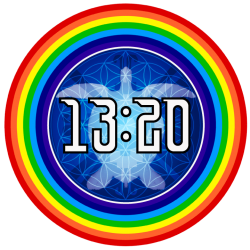 Turtle of the Thirteen Moons: Indigenous Time for All Humans. Thirteen Moons in Motion. 1992 Planet Art Network. Get involved: Please contact us if you would like to contribute to honour the memory of José and Lloydine (blogs, reports, photos, videos, art, historical publications, media records). Jose and Lloydine Arguelles are the wayshowers and messengers, showing us the nature of time and the effect of linear time living 24:7 in the period of Industrial Revolution that ended in 1987, according the Mayan prophecies. With the Harmonic Convergence. It’s always easier to look back in time as we know it, linear time, to connect the dots and see a pattern. As I perceive it, we’re now amidst the falling apart of material greed and abuse of power, which always are in sync: money and power are ruling the world for many members of humanity, specially the very rich. They’re never at peace, my goodness, how happy I am for not being rich with money, not carrying that burden on my shoulder. Joining the message of Jose and Lloydine, are some of the teachers I’ve come to know: Drunvalo Melchizedek, Eckhart Tolle and Thich Nhat Hanh and those who aren’t in the public spotlight, living their truth. There’s no greater sense of liberation and expansion, than acknowledging and releasing resistance and surrender to who I am in life and love. There’s no beating around the bush when one chooses to live one’s truth. One needs to journey through one’s own darkness, if that’s a reality, in order to reach the light that is always there. One’s own light that is. Suffering on planet Earth is mostly self-proclaimed, in fear and lack of affinity within one’s heart for oneself. Pluck the courage to ask for support and receive it fully, without a doubt. “Ask.. and you shall be given” is a deep statement, spoken by Jeshua, it rings true in my ears and it’s an experience in my life, with great humor. For it’s my own Higher Self that accompanies me more and more and no external authority rules over that part of me.